April 13, 2019, Griffin, GA — Saturday, April 13, 2019 will kick off Griffin’s newest downtown initiative titled “Second Saturday” in historic Downtown Griffin. Occurring monthly on the 2nd Saturday of each month, this free community-oriented event will serve as an open house to showcase what downtown has to offer. Partnering with local downtown businesses and artists from across the region, each month will offer a truly unique experience based around a designated theme—April’s theme is “Spring Into Art!” celebrating the rich culture of arts in our area. Each month will offer a truly unique experience and a different theme—always something new: including new artists, special events, new deals, giveaways, and promotions at varying restaurants/retailers across downtown, and more! Art will always be included in these events, however the first event in April will be primarily focused on art. Presented by Griffin Main Street and in partnership with Griffin Downtown Council, City of Griffin, and Flint River Alliance of Visual Artists, the purpose of Second Saturday is to energize the local community to come out to shop, dine, and explore Downtown Griffin. Beginning at 5pm, over 30 local painters, artists, and craftspeople of every collective will be found lining the streets of Hill Street and Solomon—as well as at marked locations throughout the historic downtown area—and in partnership with local businesses to feature live demos, pop up shops, exhibits, and more. Businesses throughout downtown will be open late with shopping discounts, sales, promotional giveaways, and deals only available on Saturday, April 13. The lineup for this kickoff event is extensive! Aprils featured artists include: world-renowned glassblowing artist Devan Cole from Hot Glass Academy, who will be molding and shaping hot glass into various forms onsite, Legendary Blues Harmonica Player, Bennie Mobley who will be performing and reciting stories while traveling around the streets Downtown, and Local Sidewalk Chalk Artists who will be creating a mural near the Park at 6th and inviting you to join in the fun—Color your own sidewalk chalk creation! Participating businesses and activities include: Spring Open House at Broad Street Mill and Shoppes, Grand Opening at The Cotton Mill, Expo at Iris City Market, 10-25% and $2.50 sales rack at 2nd Time Around, $40 Wine Basket Giveaway at Sip N’ Shop, show ticket Raffle at Main Street Players for their upcoming play “Hank Williams Highway,” as well as promotions and artists at 6th St Pier, Angelo’s Mediterranean Cuisine, Bank Street Café, Built to Last Tattoos, Corner Café, Cyber Cloud, Doc Holliday’s Saloon, Frios, Griffin Gallery, Intent Yoga, Lola’s Cigars, Safehouse Coffee Roasters, Slices Pizzeria, ‘stache studios, Solomon Street Barbers, among others! April’s Second Saturday “AFTER DARK” events will provide additional entertainment offering something for everyone. Enjoy Movies in the Park at Sixth hosted by City Church—with kid’s entertainment onsite beginning around 7:30pm until screening of the animated movie “Hop”—perfect for Easter. Or grab yourself a new green CITY GO-CUP for alcoholic beverages from any participating downtown bar or restaurant for the Art Walk / Bar Hop. (City of Griffin Go Cups will be making their official, public DEBUT at 4pm.) For the grand finale, catch the Fireworks show Downtown at 10pm! Hosted by Iris City Market. The public city parking lot across from BBT&T Bank will serve as a designated viewing area nearest the launch site, for anyone wishing to bring their lawn chairs or park their cars, and the host will be passing out goodie bags to first 50 kids to arrive, with a few activities set up prior to the show. So get ready for a great evening in Downtown Griffin. Everyone is invited to come experience the city’s art, music, food, wares, and crafts. Enjoy dinner at one of the restaurants downtown while you’re here! Maps and event brochures detailing the evening’s events will be available at participating locations. 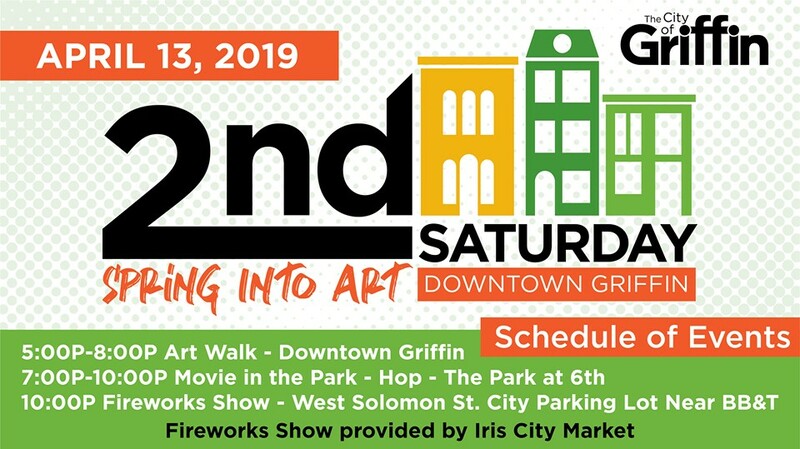 More information can be found on the Downtown Griffin Facebook Page and on Instagram under the official event hashtag #secondsaturdaygriffin.